For AMEX cardholders, Shop Small isn’t the only shopping incentive to get excited about… American Express has released a wave of new OFFERS to get your Christmas Shopping started early. There are ten new general offers, available to all amex cardholders (until limits run out). For full T&C’s see their website. 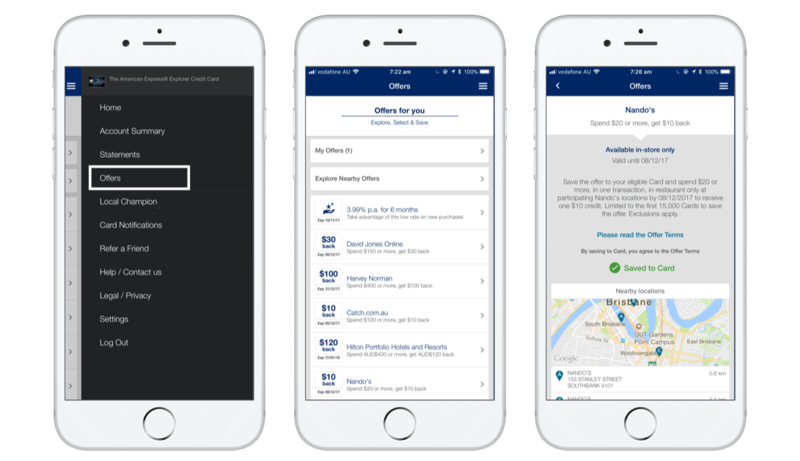 You can view and add offers through the AMEX website here, but the easiest method is via the AMEX mobile app. *Subject to availability and AMEX terms, Exclusions apply. Save the offer to your eligible Card and spend $150 or more, in one or more transactions, online only at shop.davidjones.com.au by 05/12/2017 to receive one $30 credit. Limited to the first 20,000 Cards to save the offer. Save the offer to your eligible Card and spend $100 or more, in one or more transactions, online only at www.catch.com.au by 5/12/2017 to receive one $10 credit. Limited to the first 10,000 Cards to save the offer. Save the offer to your eligible Card and spend $20 or more, in one transaction, in-restaurant only at participating Nando’s locations(merchantgeo.force.com) by 08/12/2017 to receive one $10 credit. Limited to the first 15,000 Cards to save the offer. Save the offer to your eligible Card and spend $75 or more, in one or more transactions, online only at www.getwinesdirect.com by 11/12/2017 to receive one $25 credit. Limited to the first 10,000 Cards to save the offer. Save the offer to your eligible Card and spend $100 or more, in one or more transactions, online or in-store at Napoleon Perdis by 17/12/2017 to receive one $50 credit. Limited to the first 10,000 Cards to save the offer. Save the offer to your eligible Card and spend $500 or more, in one transaction, in-store only at OSIM Australia by 05/12/2017 to receive one $100 credit. Limited to the first 10,000 Cards to save the offer. Save the offer to your eligible Card and spend $50 or more, in one transaction, in-store only at Specsavers by 31/12/2017 to receive one $25 credit. Limited to the first 35,000 Cards to save the offer. Save the offer to your eligible Card and spend $75 or more, in one or more transactions, online or in-store at My Pet Warehouse by 31/12/2017 to receive one $25 credit. Limited to the first 15,000 Cards to save the offer. Save the offer to your eligible Card and spend $1,699 or more, in one transaction, online only at shop.samsung.com/au by 31/12/2017 to receive a 20% credit back, up to a maximum of $1,000. Limited to 30,000 Cards to save the offer. This means you can spend up to $5000 online, getting a max $1000 back in credit to your card. A great use of this offer could be buying yourself a GalaxyS8+ with a Gear S3. With the current online discount to the phone + your 20% back from AMEX, the watch is heavily discounted! 🤑 Have you used AMEX offers before? Follow AusTraveller on Medium for more AMEX tips and guides coming up.